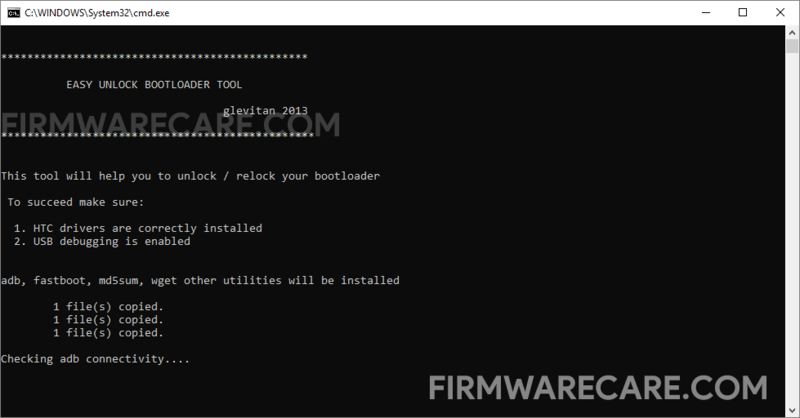 Easy Unlock Bootloader Tool is a small application for windows computer created by Glevitan 2013, which allows you to unlock the bootloader of HTC Smartphone in single click. Currently it supports more than 58 HTC Smartphone including HTC Desire V, HTC Desire X, HTC Desire Z, HTC Dream, HTC Droid DNA, HTC Droid Eris, HTC Droid Incredible, HTC Droid Incredible 2, HTC Desire S, HTC Evo 3D, HTC Evo 3D, HTC Evo 3D, HTC Evo 4G Plus, HTC Evo Design, HTC Evo view 4G and many more. The Tool only works on the HTC Smartphone running on the Stock ROM (not on the custom rom). Unlocking the Bootloader will factory reset your HTC Smartphone. So therefor we recommend you to take a backup of your personal data before unlocking the bootloader. In order to use the Easy Unlock Tool, you need to install the HTC USB Driver on your computer. After installing the HTC USB Driver on your computer you need to connect your Android device to the computer using the USB data cable. And once your Android device is detected by the computer, you need to launch the Tool. [*] Compatibility: The Easy Unlock Bootloader Application runs perfectly on Windows XP, Windows Vista, Windows 7, Windows 8, Windows 8.1 and Windows 10 (32 bit and 64 bit). [*] Credits: Easy Unlock Bootloader Application is created and distributed by Glevitan2013 (developer). So, full credits goes to Glevitan2013 (developer) for sharing the tool for free.